Don't forget to participate in our first ever Giveaway Contest! Just like us on Facebook if you haven't already, and share any article to participate. Click here for more details. A winner will be selected at the end of April. With my S2000 in the body shop after being rammed in a parking lot during a doctor's appointment, I needed a rental car to get me to and from work. Unable to find anything at a reasonable price from the large rental chains near LAX, a Google search led me to Silvercar.com (you can read my review of Silvercar by clicking here). 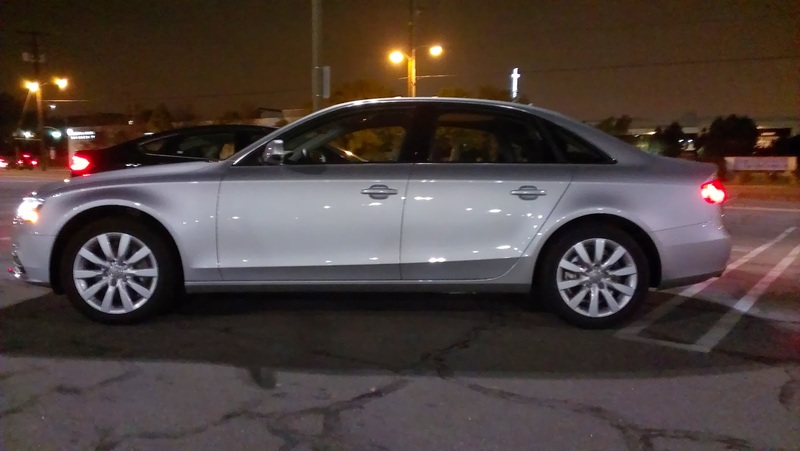 Long story short, I ended up with an Audi A4 2.0T Quattro for two and a half days instead of whatever econobox one of the large chains would have stuck me with for a higher price. At first glance, the current generation of the A4 is a fairly handsome car. Since this car came with the lighting package, it had the new LED daytime running lights and xenon HID headlamps. The LED daytime lights have a very sinister and aggressive look and offers a good contrast to the rest of the car with its fairly smooth lines. There is one major thing working against the look of the A4 though, and that is the standard 17 inch wheels for the Premium trim, which are far too small for the car. They look tiny inside those large wheel wells. The optional 18 inch S-Line wheels, or the standard 18 inch wheels in the Premium Plus and Prestige trims look far better on the car. In fact, it seems to be the case with a lot of cars these days, where 17 inch wheels just no longer cut it. Getting into the A4 was a bit overwhelming. I have gotten so used to driving cars with very few buttons and knobs on the center console, so getting into a car that has a center console still littered with buttons made me cringe a bit. I am sure that had I spent more time with the car, I would have gotten used to Audi's MMI system and its gaggle of buttons. Unfortunately, in the two and a half days I drove the car, I simply could not get accustomed to it. There were just too many buttons and transitioning between menus was a hassle. While it taking some time to get used to should be no surprise, there are also a few specific problems I found with the MMI system. The first one was with removable media and Bluetooth audio streaming. I plugged my iPod into the USB port, but in order to actually play the music from my iPod, I had to bring up the removable media menu in the MMI, find my iPod, and then scroll over to the folder where music is stored just to get the music going. With Bluetooh audio streaming, the system requires you to start the music player on your device first before it will start streaming to the car's speakers. There is also the problem with the lack of buttons on the steering wheel. Because there are so few buttons on the wheel controlling a large number of functions, your eyes have to look at the multi-info display in the dash in order to know what you are doing, which can get rather distracting. However, I think my biggest pet peeve with the MMI system is the fact that everything is tied together. This means that if you want navigation functions, the radio must be on, and vice versa. Is it so wrong for me to just want the radio on, or just have the navigation running? Sure, you can mute the sound coming from the radio if you do not want to listen to it, but if you turn the radio off, you turn the entire system off, effectively turning off the navigation too. Hey, at least the graphics are pretty. Audi can thank nVidia for that, assuming the MMI system is still powered by an nVidia graphics processor. 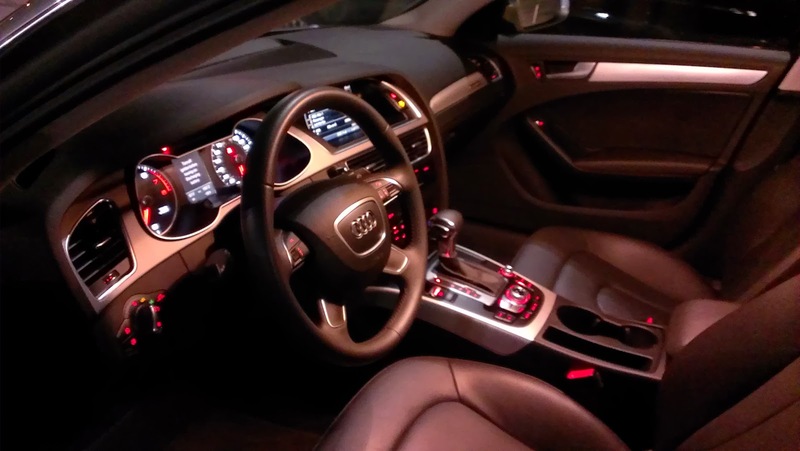 The MMI system aside, the rest of the inside of the Audi was actually pretty good. Seats were comfortable and the interior materials felt of a high quality. The red interior ambient lighting makes one believe that this car is high tech, aggressive, and fast. I was not a fan of the four spoke steering wheel, but that can be fixed with the optional three spoke wheel found in the S-Line package for this trim. The shift knob was a bit odd though, mainly because it was so big. The last time I drove a car with a shift knob that big was my 1997 Honda Accord LX. 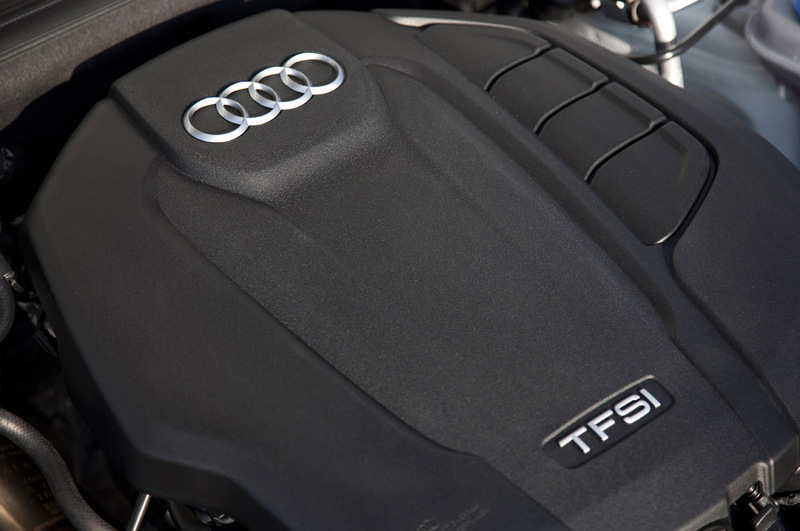 Another issue I have always had is with the VW-Audi family of 2.0-liter turbocharged four cylinder engines. But my problem is not with its application within the A4. No, in fact my problem is with its application in the Volkswagen GTI. Despite being essentially the same engine (with some minor tuning adjustments, of course), it feels slower in the GTI, and the turbo lag is unbearable at times. In the A4 though, this engine is fantastic! Turbo lag is virtually non-existent, power delivery is smooth, and power is good throughout most of the rev range. While I do prefer the 6-speed DSG in the GTI over the 8-speed auto in the A4, the A4's transmission is not bad. It does not shift as fast as the DSG, but it does manages to not exhibit the one major trait I really dislike about automatic transmissions with more than six gears: being confused with what gear to be in. Another negative is that the exhaust and intake sound are more than a bit muffled. I know Volkswagen tunes the exhaust in the GTI to make the engine sound more throaty, but I had hoped that they would have done something similar for the A4 to give it a little more aggression. While the engine and transmission are quite good, I would probably rate the handling, steering, and braking as adequate. We begin with the steering, which is a huge improvement over the last generation A4 that I test drive quite a few years back. This time around, the steering actually feels properly weighted and feels heavier as speed increases. And unlike the previous generation models, it does not feel like I could steer the car with one finger while traveling at low speeds. While the weight is a big improvement, communication between the wheels and steering still feels fairly dull. Thankfully though, it is not bad enough to the point I cannot tell where the wheels are pointing. The brakes offer a good, progressive feel, but could probably use some better brake pads as I often found myself needing to brake a lot earlier than I expected when coming to a complete stop. Handling was pretty much luxury sport sedan standard. It definitely was a bit on the cushy side, but still firm and sporty enough to have a little fun with. Also, having the Quattro all-wheel drive system fixed a lot of the potential issues that comes with a front-wheel drive car (the A4's standard layout), such as torque steer while accelerating. One thing Audi could have managed better on this car was the body roll. It rolls a fair bit more than what I would expect from a car that is supposed to be a sport sedan. Fortunately, this problem can be fixed with the optional sport package, which re-tunes the suspension for a sportier ride. Unfortunately, the sport package is not available on the Premium trim. You would have to get the Premium Plus or Prestige trims to gain access to the sport package. Bummer. For a while now, Audi's TV advertisements claim that more and more drivers are switching from, BMW, Lexus, and Mercedes. The funny thing is that, if you will recall, East Brother and I have actually test driven the A4's competitors from BMW, Lexus and Mercedes. The question remains though: is the A4 a better car than its competitors? The A4 definitely drives better than some of its rivals, but not as well as others, and its interior quality rivals its competitors from Lexus and Mercedes. Price is roughly the same as the Lexus and Mercedes too. The BMW 328i? That comparison is a bit unfair since the version of the 328i we test drove had the M-Sport package and six-speed manual. This set up not only gives the BMW an advantage in handling, but also puts the car well over the $50,000 mark. 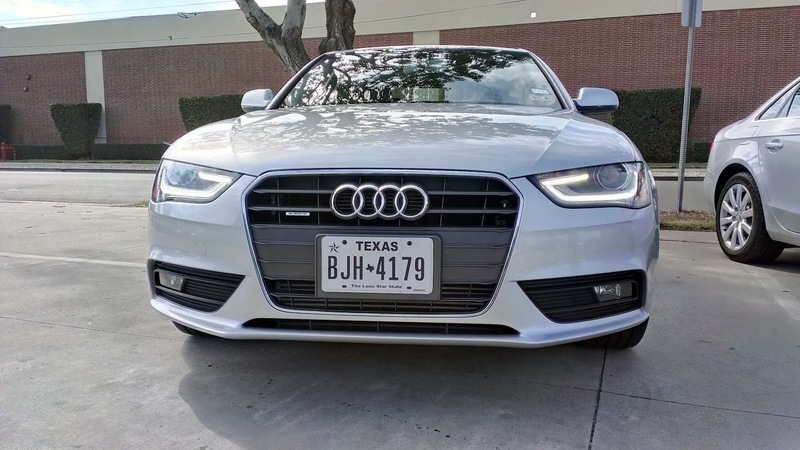 At that price, we would be looking at the S4 with a manual transmission and the 3.0-liter supercharged six-cylinder motor and its accompanying sport suspension. 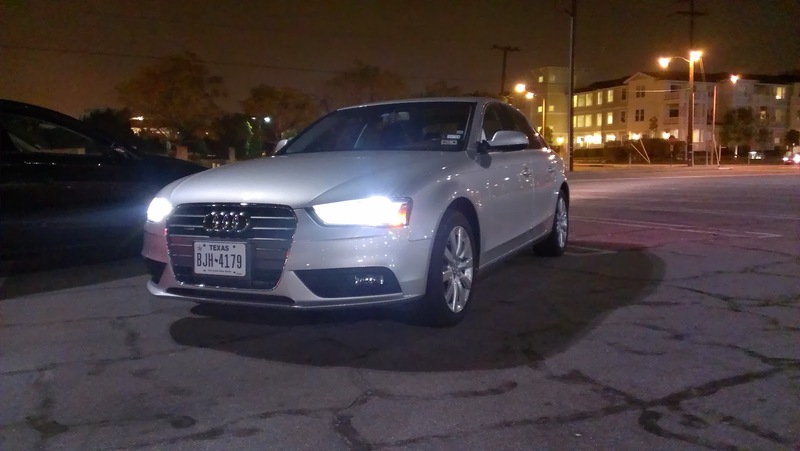 Overall, the A4 is a good car and definitely one of the more restrained in appearance in its class. Sure, the MMI system is annoying, and a back-up camera is only available as optional equipment on a car that starts at well over $30k. However, when compared to its German and Japanese rivals, the A4 definitely holds its own. Thanks again to the team at Silvercar for access to the car. 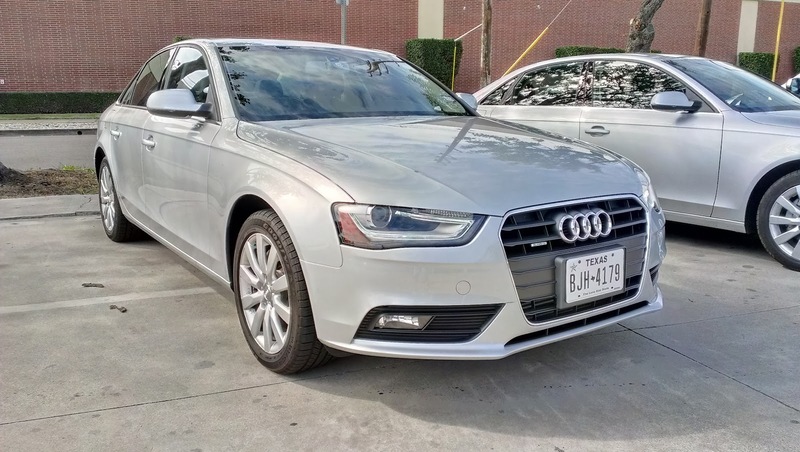 If anyone is interested in Silvercar's service, there are still a few days left to use coupon code "Welcome50" to get 50% off your first reservation. The code is good until March 31st. Editorial: What makes a car beautiful?